Animated brushes have 3 different sizes. You can set 3 different density. This allows you to achieve amazing results while drawing. You can create great animated drawings or static drawings. This cool magic painter will allow you to create a fantastic animated live wallpaper. Write down a name using colored fireworks or fire flames, draw a lightning of explosions, create animated photo frames, whatever you want and when you want. Use your imagination. 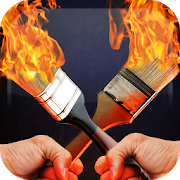 If you lack a particular brush email us, we’ll add it to the magic painter update. Watch our demo-video, it shows what you can do with application to animated drawing. View our gallery of drawings, live wallpapers and photo frames, which will give you an idea of how to draw.